OPW is conducting a voluntary recall of certain gas station hose swivel connectors. The recall includes the popular models series 241, 36 and 20 of swivel connectors, which are installed between the nozzle and hose of gas station pumps that dispense refined fuels such as gasoline, diesel, ethanol blends, and biodiesel blends. The issue detected on these swivels is that in certain rare cases, the retaining rods used in these models may not perform as expected, resulting in unintended separation at the swivel connections. This unintended separation may lead to fuel spillage, posing a chemical or potential fire hazard. While regulations and warnings prohibit the presence of ignition sources at the pump, serious personal injury can result if an ignition source is nevertheless present. Recalled swivel connectors have a “MFG” date printed on the end in the format of: MM-YY or MM-DD-YEAR or MM-YEAR. 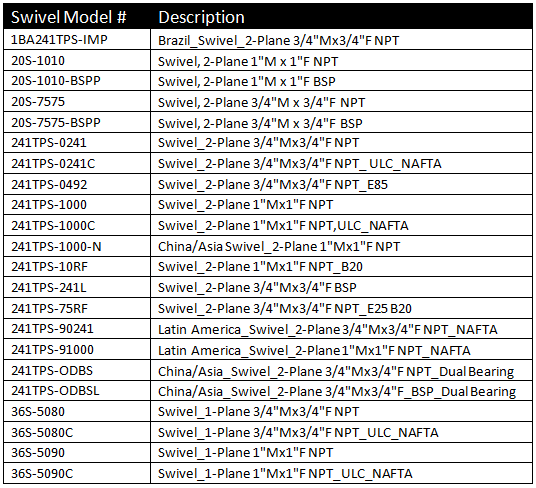 In the case of swivels series 241 and 36S only those with a stamped MFG date of January 2013 through March 2017 are affected. While those of the series 20S, affected dates are January 2013 through August 2017. The model number is printed on the body of the swivel connector. • Remove or replace all swivels with the affected model numbers and within the affected date range. • If the swivel was installed as part of a hose kit, only the swivel needs to be replaced, not the entire hose kit. • Register for the recall using the https://OpwSwivelRecall.expertinquiry.com website or by calling 1-866-562-5931 between 9am and 5pm EST Monday through Friday. You must provide contact information and certain information to identify the affected swivels to be replaced. • OPW will directly ship new, alternative swivels to replace your recalled swivels. • Tag and dispose of the recalled swivels per the instructions provided with your new swivels. • REMOVE OR REPLACE AND DO NOT REUSE RECALLED SWIVELS. THERE IS A RISK OF FIRE, SERIOUS PERSONAL INJURY, AND DEATH.